Our party of 12 was a mix of adults and boys between 11 and 12. 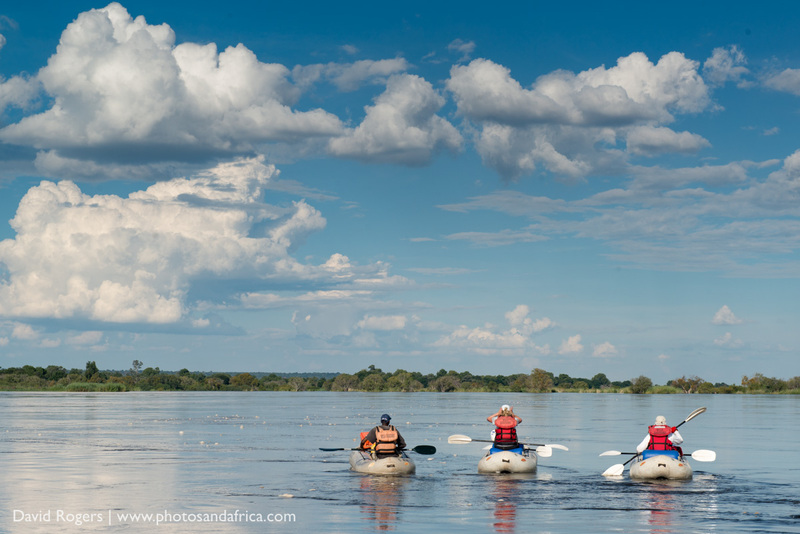 Starting in the town of vic falls, we were collected from The Look out Restaurant in open vehicles, each piled high with our luggage plus the inflatable Arc boats on the roof. 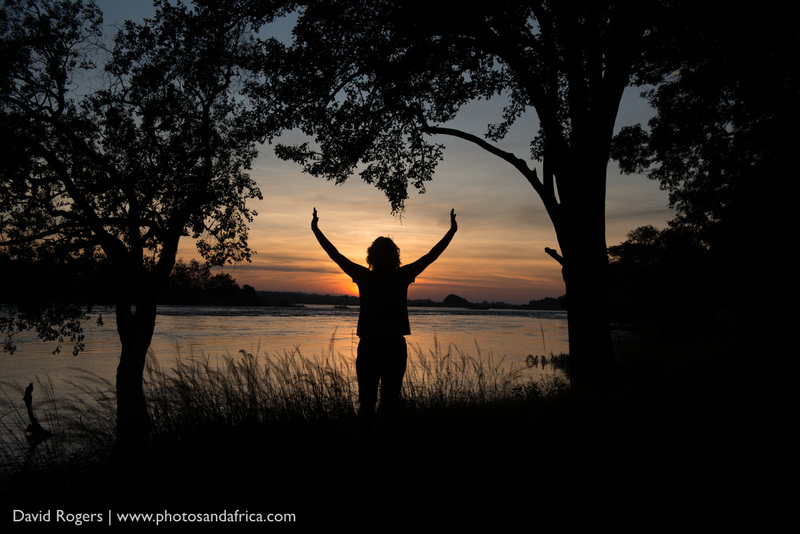 A short drive out of town we entered the Zambezi National Park, and a game drive followed to our starting point, that was stunning! Winding past Baobab trees and Mopane woodland, we were lucky enough to see a small group of wild dogs. Kids sang happily as we passed a family of elephants, kudu, waterbuck and a Marshal Eagle - finally spotting the river as we turned off to our camp. We came upon a long table set for dinner on the waters edge with a group of cheerful camp staff ready to greet us. Tents lined the river front, and we were quickly briefed on the toilets, showers and camp safety. There was nothing between us and the wilderness around us. Baboons shouted their warning calls as the boys rigged up their fishing rods in the hope of hooking some tiddlers for the next day’s Tiger fishing. Dinner was a three course affair that started with soup, followed by pork chops, chicken, rice and a strawberry desert. Tired and happy and smelling of wood smoke from sipping wine around the fire, we fell in to our comfy beds lulled by the rush of the Zambezi and the occasional hippo chuckle. There is no sleep quite like that! The day dawned hot and clear and we packed up for a day on the river. Driving up river from camp for roughly an hour brought us to the put-in point, where we were briefed on river safety and the threat of rapids, hippos, crocs and dehydration. Kids listened wide-eyed. The boats were comfy two seaters and were super-stable, albeit it quite difficult to steer. There was little time to adjust, as we paddled straight in to a series of rapids that ran on for nearly an hour with little respite. The two guides Gabriel and Mangezo lead the group single file through the rapids, and watched eagerly for hippos in the quiet eddies. Finally we moved in to a wide calm section of the river where we could enjoy water fights, joining boats to ‘raft’ a while, sing, chat and look at the passing scenery. The riverine fringe of giant figs, Jackalberrys, sausage trees and baobabs often hosted fish eagles, gymnogenes and squabbling baboons. Kingfishers and bee eaters swooped low past our boats in colourful flight and a couple of frogs even landed in the boat to hitch a ride. The lunch stop was a great surprise – we expected some sandwhiches, but arrived in a clearing on the bank to find our camp team cooking on the ‘skottle’ and soon a delicious hot meal of chicken, pork breast kebabs and potato salad were served along with the coolbox full of ice cold drinks. The boys got back to fishing for live bait and the adults snoozed in the shade. The last two hours on the river after lunch were slow and hot and we found the direct sun a challenge to ward off our bodies. When our familiar camp came in to site around the corner we were overjoyed as the sun was already low and the kids exhausted. With keen fishermen amongst us, we headed straight to a point near the camp where we enjoyed sundowners and did some fishing – unsuccessfully! Dinner was another treat, and after the braai we were surprised with some Mopani worms to sample (urgh!) and a birthday cake bought all the way from town for the member of our party who was celebrating his birthday. Another amazing surprise touch by the wonderful Wild Horizons team. The second morning we had a slow start, knowing it was only a few hours to the end. We launched in to small rapids with stiff muscles, only to come around a bend in the river and to see literally hundreds of elephants drinking and swimming in the river! It was a sight that I will not forget. The bank was lined with elephants of all sizes, and the channel itself was blocked by the elephants playing, splashing and cavorting in the water. We pulled our boats over on to a sandy sand spit and watched enthralled as this spectacle just kept getting more incredible as more elephants filed out of the bush in huge numbers. When we portaged our boats over the reeds to a different channel to finally sneak past them – we came across more down river doing the same and had to wait again as they finished their revellery. Trumpeting, rumbling, - the shear energy of so many elephants so lose to us was miraculous – even for bush-hardy folk. On a high, we paddled the last section and the plume of the famous Victoria Falls finally showed in the distance and we knew sadly that this was over. Pulling our boats out the water to enjoy a last lunch, we all felt a terrible loss moving away from this river. We had felt one with the rythms of its giant tide, pushing through a green wilderness, rich in life and prickling with birds, dotted with butterflies and canoepied by huge white clouds pushed up against the bluest hottest sky. Our kids had ridden its rapids with adrenalin and with joy, we had saluted the hippos and felt the massive surge of that water forging its way towards the waterfall. Instead of feeling like spectators, we had shared its meandering channels at one with the beasts that live beside and in it. 1. Safety: We did this in high water, where rapids were quite low, albeit it very fast moving. The inflatable boats are very stable and it is difficult to flip them. Guides were very careful and attentive – mostly with a lead guide in front and a ‘sweeper’ behind. All guides are qualified river guides. They know where the hippos are and we generally never got very close to them and they were never a threat. Keep clear of water edges to avoid crocs, but in high water we saw only a few little ones. Rapids are small, and if you can avoid logs and rocks you will have no problems. Your biggest danger is dehydration and sun stroke on the river. 2. Kids: Kids from 7 up are allowed to join this trip. We suggest kids over 10. Kids must have an adult or older experienced paddler in the steering seat as the boats take some strength and skill to maneuver in to and through the rapids. 3. The Camp: The camp is very comfortable. Each couple gets a walk-in tent with comfy beds and duvets. The showers are warm bucket showers. Toilet is a hole in the ground with a proper toilet over the hole and all within a canvas enclosure. Not for those who are toilet-phobic. 4. Food: The food is excellent, plentfull, very filling and cold drinks are always close at hand with ice. We even had a birthday cake delivered! 5. What to bring: Few light clothes, plenty of sunscreen and hats with good cover, waterproof shoes. You will be supplied with a waterproof bag for cameras. Go pro cameras are great! Bring your own fishing equipment if you are after Tiger Fish! Head torches and lights for the rooms. Your luggage remains with you at all times. 6. How to improve it: Do more days and consider combining it with a night in a lodge. 7. How to book: contact family travel specialists: www.villasandafrica.com/ jenni@villasandafrica.com. Six things that surprised me about Campervan travel in South Africa.